This traditional origami technique is normally used to fold napkins for an elaborate table setting. We love the look of this model when it is made with paper, it has a much crisper, neat look. When you use a napkin, the extra layers of paper or fabric give it a fuller, plush look. If you were going to use a napkin, start with either an ironed fabric napkin, you will need to iron the napkin at each step. It would help to use steam for the fabric napkin. For a paper napkin, you could probably get away with not ironing but you would have quite a floppy result. We would suggest practicing with paper first! You will need one piece of square paper. In the photo above, the pretty patterned paper is from a set of beautiful origami paper called- 'Kimono Patterns' by Tuttle, you get 48 sheets of 20 x 20 cm in 8 different patterns which are on both sides of the paper. 2. Fold in half top to bottom. 3. Fold in half left to right and unfold. 4. Fold the right side into the middle crease. Repeat on the left. 5. Unfold the left and right sides. 6. Flip the paper over. Keep the opening at the bottom. 7. fold the right edge in to the first crease. 9. Fold the right edge over to the first crease on the left. 11. Fold the left edge to the second crease on the right side. 13. Collapse all the folds. 14. Keep the left side at the front. 15 & 16. Fold the top left corner diagonally to the right. 17 & 18. Fold the bottom left corner diagonally behind. 19. Fold the bottom up to the top. 20. Unfold the last step. 21. Unfold the diagonal folds. 22. Refold in half bottom to top. 23 & 24. Fold the two flaps with the diagonal folds together and insert them in between the folds. 25, 26 & 27. Gently pull out the fan, stretching out the folds a little until it sits nicely flat on a surface. Don't worry if you had a bit of trouble, try again and remember it takes practice to get it right. Let us know how it went! Just tag #paperkawaii on Instagram so that we can see them! 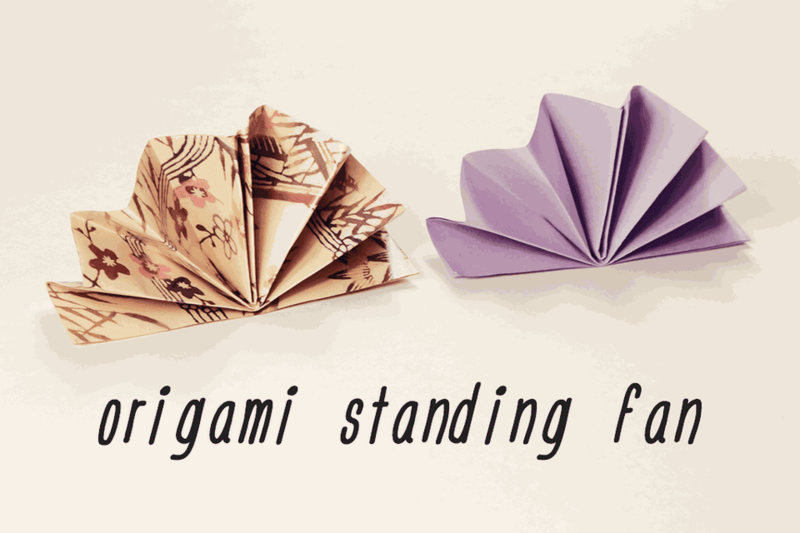 For more tutorials and also video tutorials, check out Paper Kawaii on YouTube.